Photo: Hoover Cabin, ca. 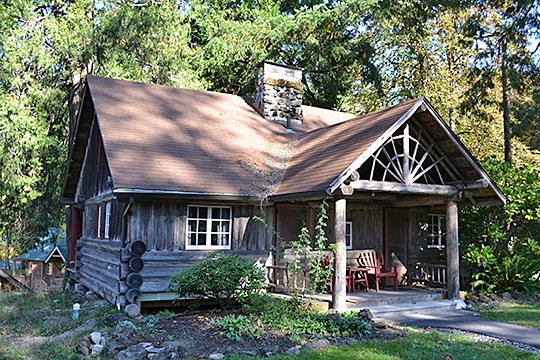 1906, is the only remaining site from the Log Cabin Inn, McKenzie Bridge, Oregon. Located at the western edge of the Willamette National Forest, the property is nestled along the southern banks of the McKenzie River at the base of the Cascade Mountains on Highway 126. Listed on the National Register of Historic Places in 2002. Photographed by User:Visitor7 (own work), 2011, [cc-by-3.0 (creativecommons.org/licenses/by/3.0)], via Wikimedia Commons, accessed April, 2013. Lane County administrative offices are located at 125 East 8th Avenue, Eugene, OR 97401; phone: 541-682-4150. The county was created in 1851 from parts of Benton and Linn. The county gained access to the Pacific Ocean in acquiring part of Umpqua County in 1853. County population during the Civil War was about 4,800 residents, rising to approximately 325,000 in 2010.